Today I decided to make beeswax candles. My results are interesting, but the candles are still hardening as it takes 48hours before the candles are ready to be used! 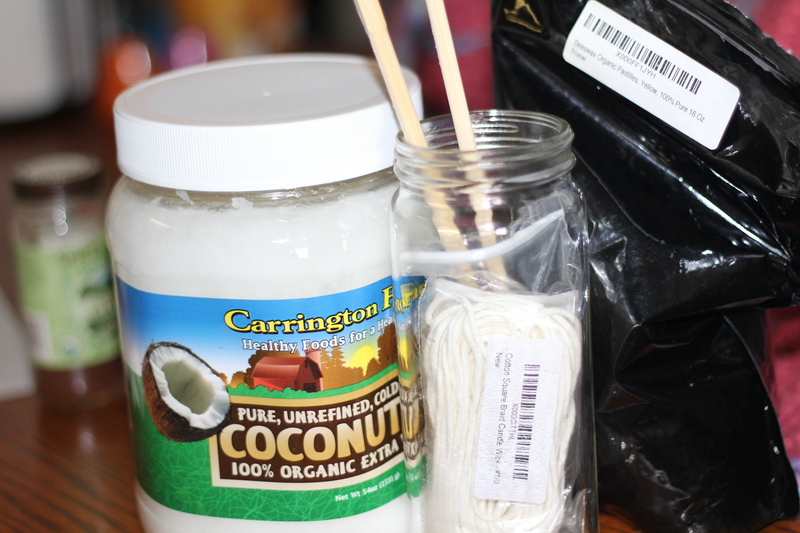 I found a jar large enough to hold the beeswax and coconut oil. 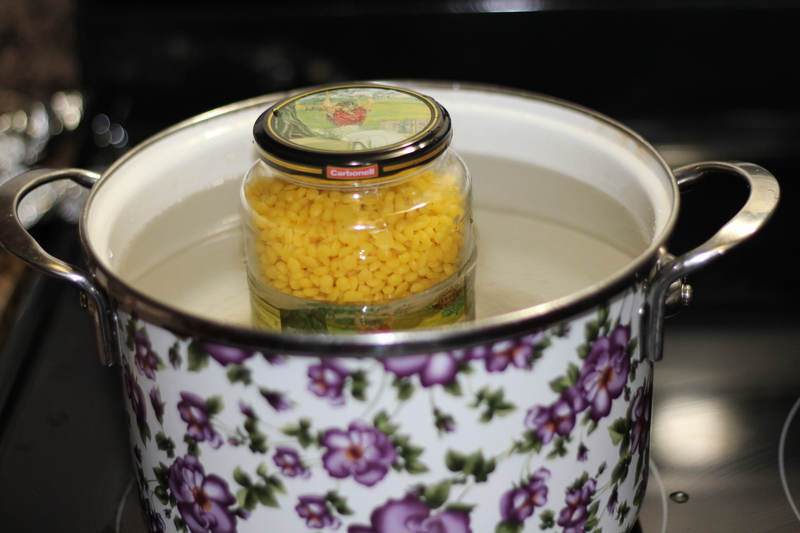 I filled this jar with the beeswax, put the lid on it, and put it inside the large pot. I then filled the large pot with water and put the burner on high. I let this sit and do its thing until all the beeswax was melted. The beeswax formed a large sphere and then slowly melted away. When the wax finally melted (it took awhile) I took it out of the pot with tongs. I handled the jar with hot mitts and removed the jar’s lid. I then put the coconut oil inside the jar, replaced the lid, and boiled the jar a tad more until everything was melted. I then shut the heat off, removed the jar from the boiling water for the last time, took the lid off, and poured the wax and oil into each of the jars. As you pour, make sure the wicks stay centered in the jars. From what I understand the candles have to sit 24 hours, then I cut the wicks from the chopsticks. The candles then need to sit another 24hours before being used. I based a lot of my DIY project on this blog. I wish I could say the brilliant idea of taping the wicks to the bottom of the jar was mine, but it’s not. I found this idea in another blog, which I would LOVE to credit, but I currently can’t find it. 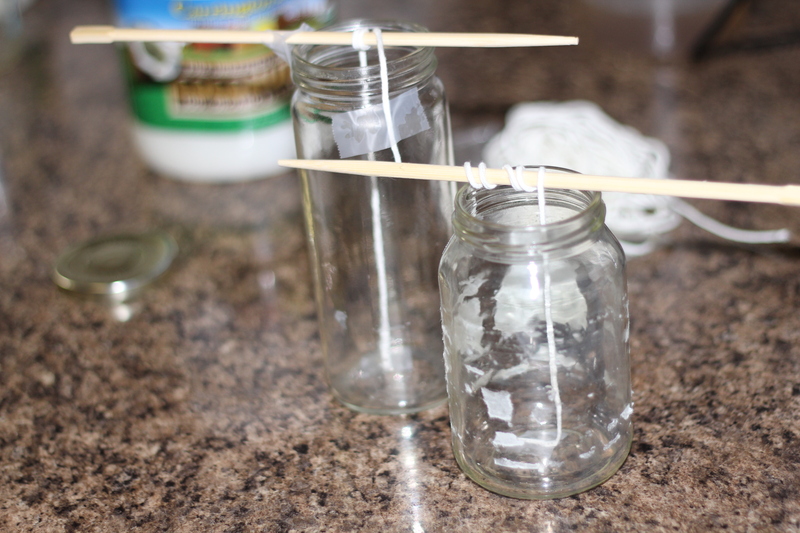 =[ However, it was my idea to tape the top of the wicks to the outside of the jar to assist in keeping the wicks in the center of each jar. You want to make sure the wick is kept centered in the jar while pouring the hot liquids. I did not have any problems with this thanks to the tape on both ends of the wick. I think my idea of using chopsticks was great as opposed to pencils because you can just throw away the chopsticks when you’re finished using them. Also, you don’t have to waste any good pencils or pens behind this project either! You could always save the chopsticks for next time too. 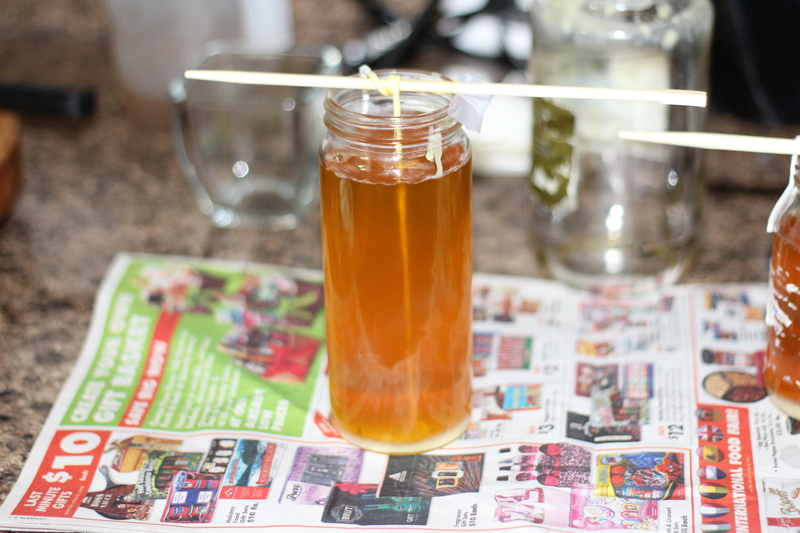 I also preferred to use a big glass jar to melt the wax and oil so that I did not have to deal with the hassle of cleaning wax and oil out of pot I cared about. 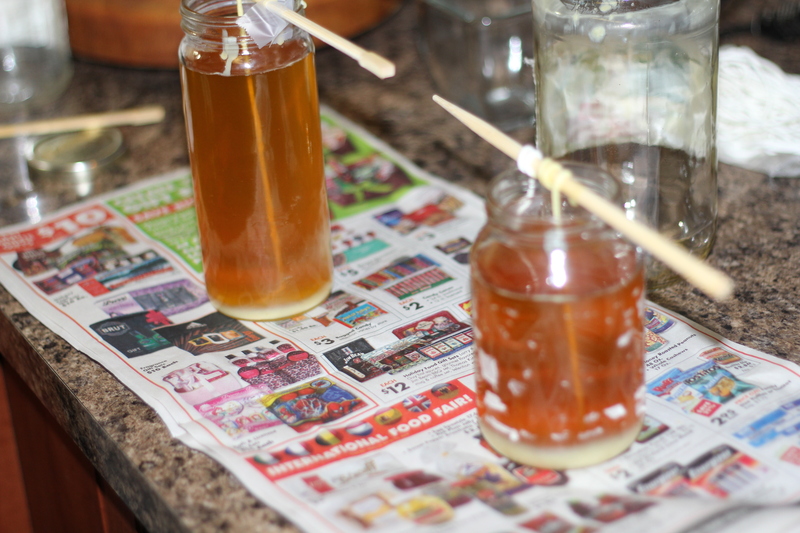 By using a glass jar I have lessened my clean up immensely! After my candles were made, I noticed there was directions on the wick’s package explaining to soak them in wax before use. I did not do this so hopefully as the wicks soak in the wax and oil as the candle hardens this is enough…! I hope you enjoy this DIY. I plan to post pictures of my finished candles too! These look awesome! I bet they’ll look great when they’re done! Aw, thank you! I will have to take a picture to show everyone! How do I know what what size wick to use for 8 oz mason jars? I hope this helps! This is what I used to decide what wick size I wanted to use. Thanks for reading and commenting.